Please register for all hikes with the leader listed in the description. Bring lunch, water, rain gear, sunscreen, and appropriate footwear. Hiking boots are recommended for longer hikes. A donation of $5 ($3 for Sierra Club members) is requested of hikers over age 14 except where otherwise indicated. Hike description key: (C) conservation focus, such as discussing how to conserve this land for future generations to enjoy; (E) educational, such as visiting and learning about archeological sites and naming the plants and flowers; (S) service outing (no donation requested), (D) round trip hike distance. We always welcome more hike leaders! Contact sierraclubmauigroup@gmail.com if you are interested. Check bit.ly/SCH-Maui-Outdoors for updates to the schedule. East Maui Irrigation Company (EMI) allows access to their trails as long as each hiker has a waiver. An EMI waiver is absolutely required for EMI hikes. One waiver covers all EMI hikes for this quarter. Call in your waiver request at 579-9515 well in advance to make an appointment to sign it. Then go to EMI’s Pāʻia office at 497 Baldwin Avenue to sign the waiver. It is open Monday 11am-3pm and Friday 8am-1pm. Waivers cannot be mailed, faxed, or emailed. Please be considerate of EMI staff time and pick up the waiver 5 days in advance whenever possible. The waiver must be brought on the hike and shown to the hike leader. Moderate hike hike through big tree forest, shaded all the way and mostly level. Meet in the parking lot across from St. Joseph’s Church on Makawao Ave at 9:30 am. Leader Kalei Johnson <kalei1908@gmail.com> or 344-0006; leave your phone number. Easy trail clearing along trail to Waikapū stream, followed by a short hike to a “secret valley” and swim. Water-friendly footwear required. Bring loppers, small saws, cane knives, gloves, water, lunch/snack. Meet 9am Maui Tropical Plantation parking lot south end. Limit 18. Contact Hike Leader: Lucienne de Naie, laluzmaui@gmail.com or 214-0147. Assistant leader Robin West. Intermediate, but high altitude. Beautiful views along trail. Leave cars at Hosmer’s Grove campground and shuttle up to hike down from Halemauʻu at the crater rim (8,000’). Prepare for wet/windy conditions. Meet 8:00 a.m. Pukalani Terrace Shopping Center near Ace Hardware. Wear footwear for rocky conditions. Bring hat, jacket, lunch, plenty of water, and a park pass (if you have). A hiking stick may be useful. Leader: Kalei Johnson <kalei1908@gmail.com> or 344-0006; leave your phone number. Victory hike! Celebrate the natural Olowalu coastline, once proposed for hundreds of condos and commercial development. Learn about Olowalu’s rich history and enjoy a swim or snorkel. This is a unique opportunity to visit one of the most diverse palm collections in the world. The once-barren former pineapple land was restored by one of America’s greatest living poets – W.S. Merwin – into a lush, 19 acre property, with over 2,740 individual palm trees, more than 400 taxonomic species, and 125 unique genera. We will meet up to car pool at 9AM. The location will be communicated to the participants. The Merwin Conservancy staff will be our guides. Bring water and closed-toe, sturdy shoes. Long sleeve shirts, long pants and DEET-free mosquito repellent are recommended. Limit: 15. Leader: Rob Weltman <robw@worldspot.com> or 354-0490. 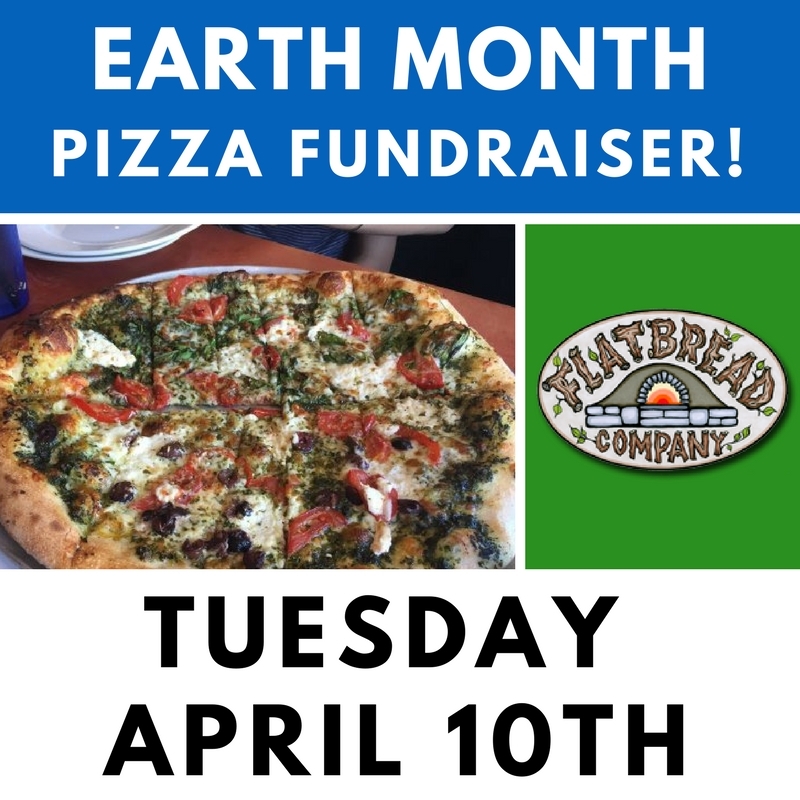 Come out Tuesday, April 10th to support Sierra Club Maui during Earth Month! East Maui Irrigation Company (EMI) allows access to their trails as long as each hiker has a waiver – an EMI waiver is an absolute requirement for EMI hikes. One waiver covers all EMI hikes for this quarter. Call in your waiver request at 579-9515 well in advance to make an appointment to sign it. Then go to EMI’s Pāʻia office at 497 Baldwin Avenue to sign the waiver. It is open Monday 11 am-3 pm and Friday 8am-1pm. Waivers cannot be mailed, faxed, or emailed. Please be considerate of EMI staff time and pick up the waiver 5 days in advance whenever possible. The waiver must be brought on the hike and shown to the hike leader. Come spend an evening with astronomer Harriet Witt and learn about the lore of our Hawaiian night sky. Bring a beach chair, blanket, and flashlight. Meet at 7pm at the entrance to the parking lot, look for the sign-in table with Sierra Club signs. Light pupus will be served. Special Event: $5 for members, $10 non-members. Register with Adriane at contact@mauisierraclub.org or 419-5143. Email or text message is best. 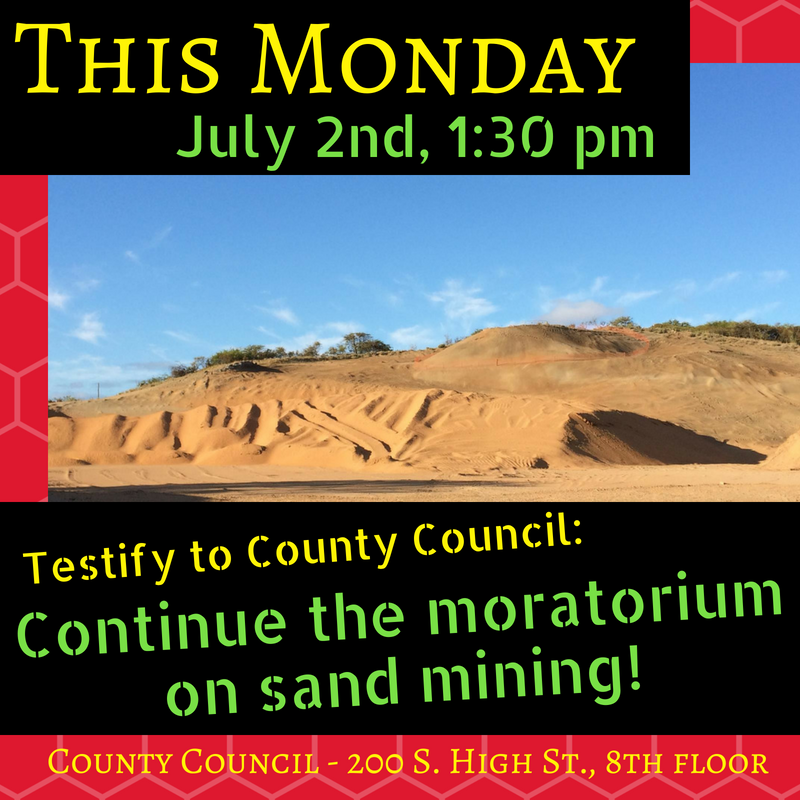 Learn about the history of the beautiful Puʻuone Central Maui sand dunes from Mālama Kakanilua, a group of local descendants who are fighting to protect this ancient traditional burial ground. Meet at 9am at Wailuku Heights Park at 655 S. Alu Rd, Wailuku. Estimate 3 hours of easy walking mostly in the sun, so bring a hat, sunglasses, plenty of water, and a snack. Special event: $5 for members, $10 for non-members. All proceeds will benefit Mālama Kakanilua’s campaign to protect the sand dunes. Leader: Adriane Raff Corwin, contact@mauisierraclub.org or 419-5143. Email or text message is best. Help clear away overgrowth from trail along south (Tropical Plantation) side of Waikapū stream then enjoy a short hike and swim. Water-friendly footwear required. Bring loppers, small saws, cane knives, gloves, water, lunch/snack. Meet 9am Maui Tropical Plantation parking lot south end. Limit 18. Contact Hike Leader: Lucienne de Naie, laluzmaui@gmail.com or 214-0147. Assistant leader Robin West. Moderate to strenuous hike of big tree forest on undulating trail, estimated time at least 3 hours. Meet in the parking lot across from St. Joseph’s Church on Makawao Ave at 9am. Limit 18. Leader: Kalei Johnson, kalei1908@gmail.com or 344-0006; leave your phone number. 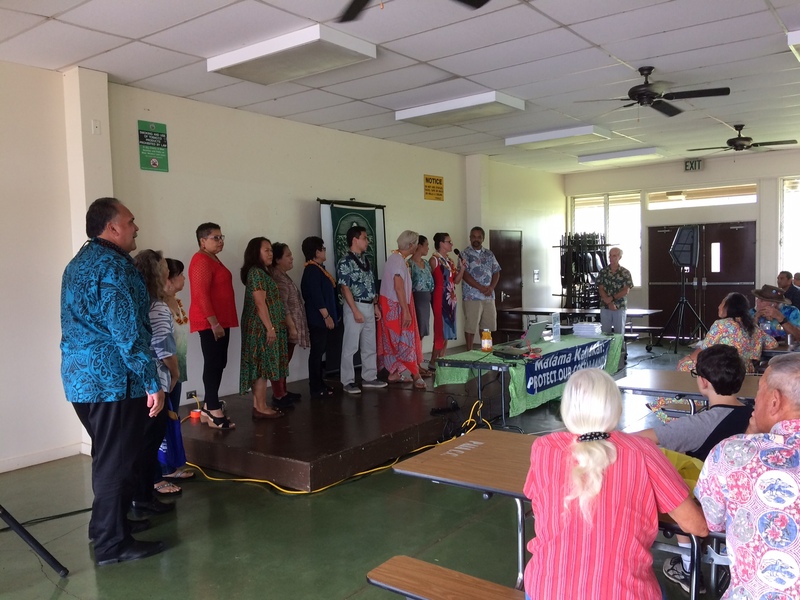 Sierra Club Maui’s Annual Meeting on February 25, 2018 was our best yet, with almost 200 people in attendance to enjoy our presentations and lunch at the Pāʻia Community Center. Sierra Club Maui honored five individuals and one group this year: Roxanna Smith and Tom Reed both received the Mālama i ka ʻĀina Award for their work to reduce the impact of waste on our island; Robin Knox received the Mālama Kahakai Award for her tireless efforts to research and protect our ocean water quality; Kelly King received the ʻOnipaʻa Award for her lifelong work to get Hawaiʻi off fossil fuels; Scott Fisher also received the ʻOnipaʻa Award for his lifelong work to protect Hawaiʻiʻs most special and beautiful areas; and the Wailea 670 Trail Crew was honored with the Volunteer of the Year Award for their dedication to clearing the trails and making them accessible to hundreds of people through our outings program (mauisierraclub.org/hikes). The Wailea 670 Trail Crew includes: Buck Joiner, Barbara Kaneshige, Liz Ebner, Amy Fazzari, Peter Drinkovich, Duane Sparkman, Ashford DeLima, Colleen Curren, Nan & Steve Jackson, Jeanne Schaaf, Amanda Hess, Alexa Deike, Gammy Arenasa, Nio Kindla, and Lucienne De Naie. All of the leis given to awardees were beautifully made by Vernon Kalanikau, Jacob & Stephanie Noury with ti leaves from Lucienne De Naie and Daniel Grantham. We invited all local politicians running for office in 2018, and sixteen were able to attend. 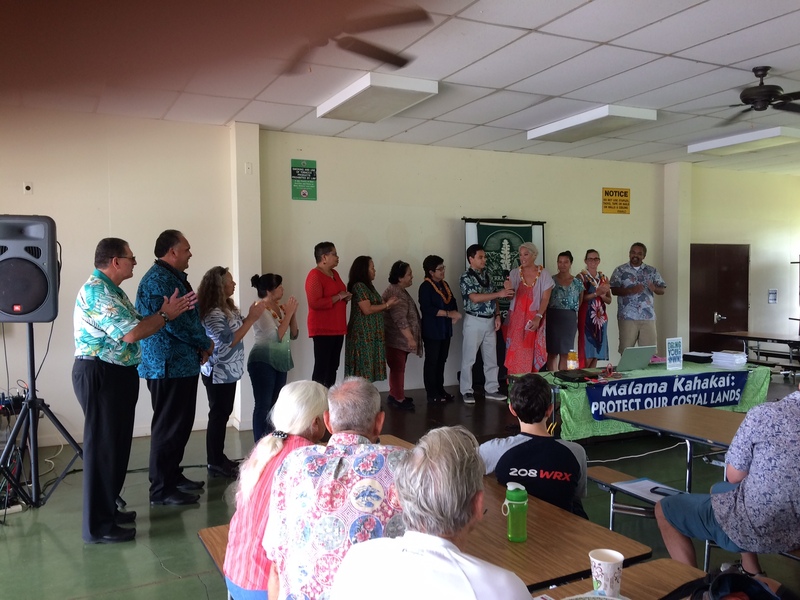 They represented races ranging from Maui County Council to State House to Lieutenant Governor, and our attendees got the chance to talk one-on-one with them all during the amazing lunch, which was generously donated by Mana Foods and Flatbread Co., with coffee donated by Mike Atherton. 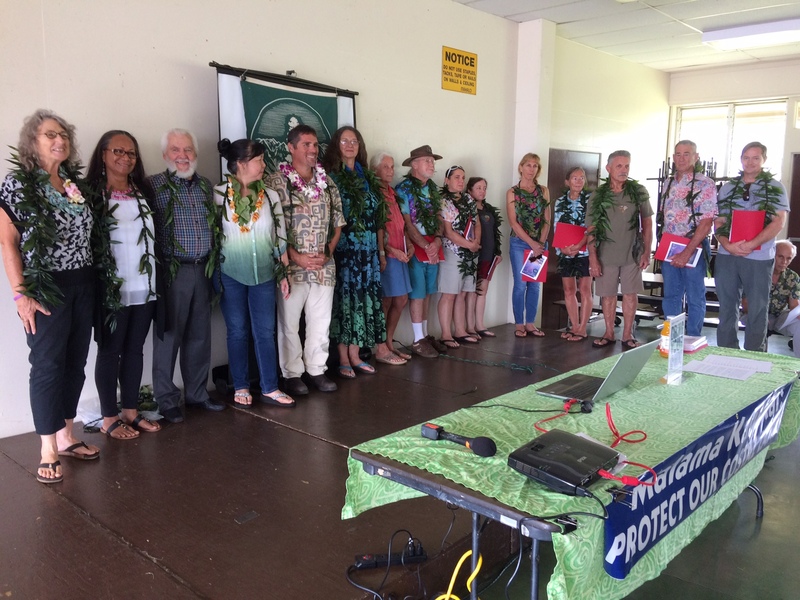 Mahalo to all attendees who also brought great items for the potluck! After lunch, our featured presenters, Tara Owens of UH Sea Grant and Matthew Gonser of Honolulu’s new Office of Climate Change, Sustainability, and Resiliency gave fascinating and alarming presentations on the impacts of sea-level rise that we’re already seeing on Maui and how the Office of Climate Change is working on O’ahu to make that island, and all of Hawaiʻi, more resilient in the face of climate change. 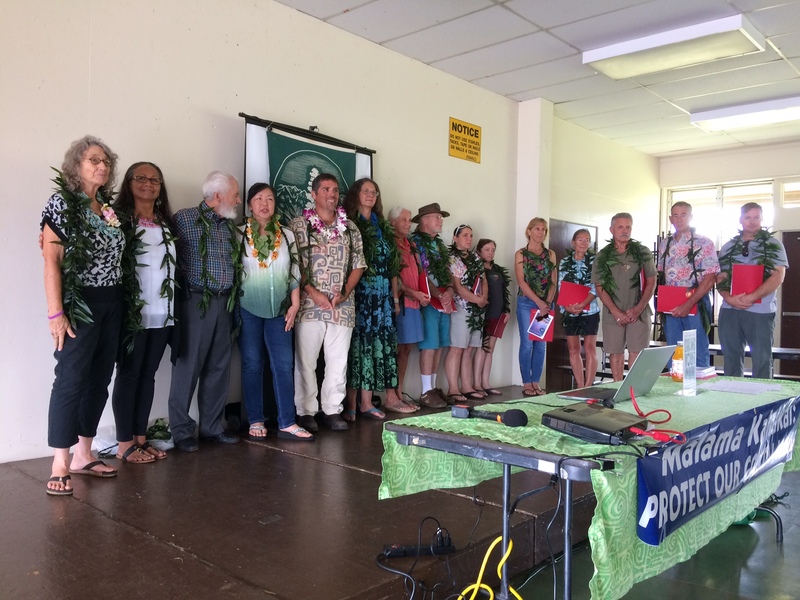 This incredibly important presentation, along with Sierra Club Maui’s group presentation and awards ceremony, is available now on Facebook at facebook.com/SierraClubMaui (scroll down to find the Annual Meeting videos). 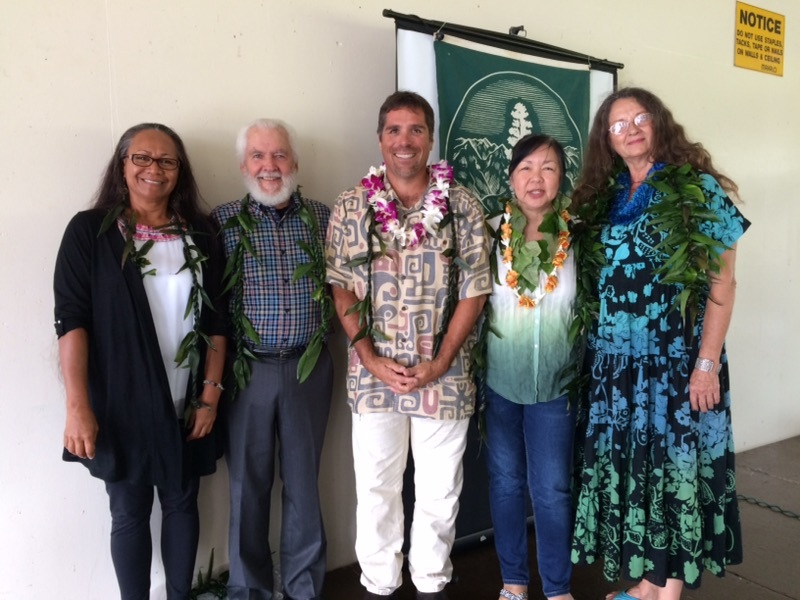 Maui residents: check for screenings of the presentation on Akakū in the coming months. 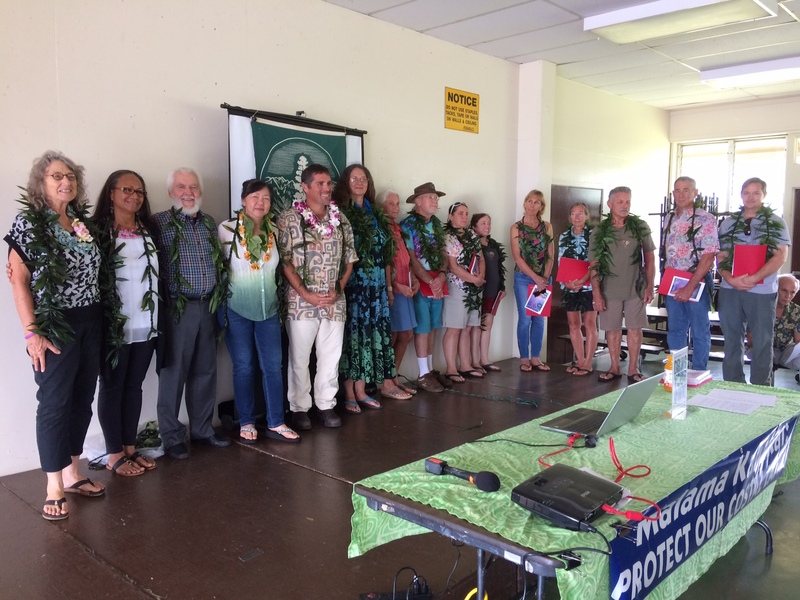 BIG MAHALO to Tim Wolfe of Akamai Productions for recording the meeting, and to our star volunteers who helped make the day go smoothly – Marta Sweeney, Miranda Camp, Clare Apana, the Toomeys, and Chuck Chimera.